Ethyl-hexedrone (also known as n-ethyl-hexedrone and hexen) is a stimulant research chemical belonging to the cathinone class. Ethyl-hexedrone’s stimulation is believed to be caused by its affinity as an NDRI (norepinephrine-dopamine reuptake inhibitor); however, there have been no scientific studies confirming this. Ethyl-hexedrone is closely related to hexedrone, with an added ethyl group on the terminal amine. This addition makes it about 3x as potent as hexedrone. Ethyl-hexedrone was first synthesized in 2011, but became available in the research chemical market during late 2015, upon which it exploded in popularity. Little research exists about ethyl-hexedrone and its parent compound hexedrone. All dosage information found on the internet should be treated with caution. 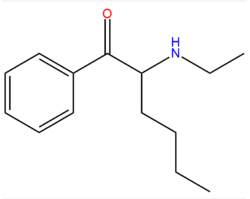 Cathinone, or Benzoylethanamine is a monoamine alkaloid found in the shrub Catha edulis (khat) and is chemically similar to ephedrine, cathine and other amphetamines. Cathinone differs from amphetamine by possessing a ketone oxygen atom on the β position of the side chain. based stimulant. Hexen (aka Ethyl-Hexedrone) acts as an NDRI to produce it’s effects, and as with most cathinones has a fast onset and short duration. This drug has very little history of human consumption and next to no research/data, and therefor should be treated with caution as a research chemical.